Did you ever wonder when you were getting ready to leave home for the first time, if your parents had taught you everything you needed to know to survive on your own? Or, are you now single after a long term relationship and don’t know where to start? Do you know how to do laundry; clean a home; balance a checkbook or cook a meal? Are you aware of the different types of deposits required to either rent or buy a home? If the answers were “yes” – good for the role models that you had! Thank them every chance you get! If the answers were “no” to most of these questions – don’t be discouraged – there is help on the way! Have you ever noticed how great you feel when you have cleaned your home or organized a room? By taking charge of your home and yourself, this will allow you to take charge of other areas of your life such as school, work, and other outside activities. What we do today, will in turn benefit us tomorrow. Your home should be your place of refuge and not a place that can make you sick, hurt you or be an accident waiting to happen. Do you change your air conditioning filters once a month? Did you know that dust and dust mites are one of the major contributors to allergies and allergic reactions? By not changing those filters you are exposing you and your family to possible illness. When you clean your home would you consider mixing cleaning products thinking that it would clean the surface quicker? Many chemicals if mixed together could have a fatal outcome. Do not mix cleaning products and make sure to clean in a well-ventilated area to avoid excess inhalation of harmful fumes. Also, make sure to check the dwell times on your cleaners. This is the time that the cleaner needs to be left on the surface before wiping or rinsing. If you do not follow the dwell time the surface may not be clean, leaving behind germs that could make you sick. When it comes to cooking, do you tend to cook in baggy clothes? If so, your baggy clothing can get tangled with the pan handles and pour the hot contents on you. Kitchen safety is one of the most important things you need to focus on. Fires can start easily and get out of hand within minutes. The leading cause of fires in the kitchen is unattended cooking. Stay in the kitchen when you are frying, grilling, or broiling food. If you leave the kitchen for even a short period of time, turn off the stove. If you are simmering, baking, roasting, or boiling food, check it regularly, remain in the home while food is cooking, and use a timer to remind you that you are cooking. If you are using a slow cooker, it is still recommended that you stay home while cooking. To prevent cooking fires, you have to be alert. You will not be if you are sleepy, have been drinking alcohol, or have taken medicine that makes you drowsy. One other area of importance is Finances. Do you balance your checkbook monthly? Did you know that many banks charge fees for check usage, overdrafts, below the balance and monthly account maintenance fees? If you do not balance your checkbook you could be overdrawn easily. Always know what you have in your bank accounts. You would be surprised how easy it is to have money disappear from your accounts if you are not watching. Do you know your credit score? Make sure to obtain a free credit score yearly. Review it carefully and do not be afraid to dispute something you feel is in error. Make sure to pay yourself first. When you get paid, put 10% of your paycheck into a Savings Account or IRA and do not touch it. Open a Retirement account immediately and make sure to contribute monthly. Do not touch this account until your retire, otherwise you will have to pay fees and penalties. 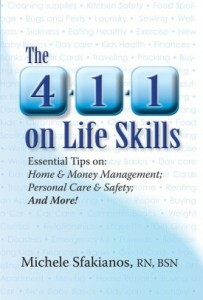 “The 4-1-1 on Life Skills” is a book about the basic life skills that are not always taught in school or at home. It contains those basic life skills that are utilized by adults of all ages for everyday living. The life skills included, but not limited to, are Cleaning; Cooking Basics; Laundry; Food Spoilage; Home/Car buying tips; General Repairs; Health and Nutrition; Relationships; Finance; First year baby basics; and much more! Check out a sample of Michelle’s book, or follow her on Facebook for more Life Skills tips.